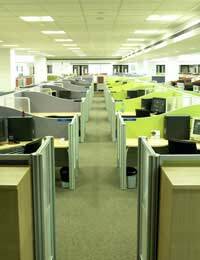 Working in an open plan office makes it both very difficult and very easy to be friendly.Very difficult in the sense of when you are working hard, it can look as though you are being rude and very easy in the sense that you see your colleagues all the time. However, working in an open plan office comes with its own rules so it is a good idea to learn some of them before you get into a situation you find it difficult to get out of. Keep your desk clear – this may sound as though it is not relevant to being friendly, but actually how tidy you keep your desk plays a major part in how others see you. If you have photos of your cat, pens with pink feathers and lots of little cards and notes, how professional do you think you come across? Yes, people may be keen to chat with you, but this will not help you to do your job well. By not having little mementos to catch peoples eye, they are less likely to stop and chat at your desk and you can chose when you do chat. Sign peoples birthday cards – when the dreaded birthday card comes round to be signed, put a nice, friendly message. A little more than ‘happy birthday’ is a good idea, but don’t make it too personal or risqué. Also make sure you contribute to the envelope if there is a collection - £1 or £2 is usually fine. If someone is promoted, congratulate them – you don’t need to get involved in everything that goes on in your office, but do make an effort to congratulate colleagues on their achievements, if they’ve it their target, won a new contract or gained a promotion. Offer to make the tea – just don’t do it all the time or not only will it be expected of you, but your colleagues wont respect you for it. Say Good morning – such a basic courtesy, but it is amazing how many people who work in open plan offices don’t do it. You do not have to go around each person individually, but at least acknowledge the people you walk past on the way to your desk, or give a little nod to anyone who catches your eye. Tell people something about you – this doesn’t mean that you should talk about your ex-boyfriend or go on about a family problem, just let people see that you are not a cold fish. There is a balance to be had between keeping your work life and home life separate without looking like you don’t like anyone you work with. Know when to share and when to hold back. Be helpful – if a colleague is working on a project and asks for your help, see what you can do. Don’t let it overtake your own work, but offer assistance where you can. If you overhear someone crying in the ladies toilet, ask if they would like to talk, or hand them a tissue. Don’t gossip – even if you hear something really juicy, keep it to yourself. Tell your partner when you get home maybe, before you burst, just don’t tell anyone you work with.